Rubbish removal and waste management company Yes Waste is proud to reveal that they have agreed to sponsor the captain of Leeds Rhinos, Courtney Hill, for the 2019 season. 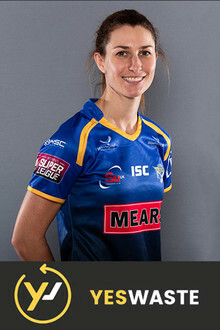 Australian Courtney Hill was one of the standout players in her 2018 debut season, scoring 65 goals and 7 tries as they went on to win the Women’s Challenge Cup, the league leaders shield and narrowly losing to Wigan Warriors in the Super League Grand Final. Nicknamed “Corker” due to the difficulty her younger sister had in saying her name, Courtney is from Queensland, Australia, and is a school teacher by profession. Originally a cricketer, making her debut for the Queensland Fire in 2009 before moving to the Sunshine Coast in order to pursue a career in professional cricket, Courtney decided to join her partner in England in 2018. It was at this point that Courtney decided to change sports to Rugby League – a game she had not played since junior level. Despite this, Courtney was given a contract by Leeds Rhinos Women and became an integral member of the 2018 team. Yes Waste is a waste removal company with depots in Leeds, Wakefield, and Huddersfield. Offering a friendly, reliable and quick service to households and businesses whilst providing complete peace of mind and a guarantee that they will dispose of your unwanted items responsibly, ethically and legally.